Product classification is simply a logical, unambiguous classification (taxonomy) of products in different product classes (categories), designed so that anyone within the sector can communicate about those products without misunderstandings. The ETIM model gives a listing of the most important technical characteristics of each product class to describe and find the products. Each class has several synonyms, thereby finding the right product is much easier for everyone! Uniform product classification in itself is not a final product as it is. The product classification is also not a software application, product database, product generator or search engine. Those are applications that use the article classification as a basis. The product classification offers the structure for standardised product data that you can exchange in a uniform way via the communication standards and which can be used in numerous applications. With the gradual growth of acceptance of product classification, it is remarkable how trading companies hesitate to participate out of fear of price comparison. They are afraid that the transparency of product information makes it easier to compare product prices. This does contain a grain of truth. On the other hand, this is already possible with current technology and the product price is of course only one of the many selection criteria for a customer. Aspects such as quality, delivery reliability, logistical performance and supplier expertise also play an important role for a customer. A supplier that is capable of providing product information electronically has the preference, because it saves the parties a lot of time and therefore also money. Wrong orders are reduced to a minimum, which leads to direct cost reductions. Standardised, automated, direct coupling and/or processing in internal automation. Therefore fewer actions are necessary and faster acting is possible. Time gained and thus savings! Up to date, complete and correct product data (throughout the entire supply chain). Quality, service and fewer errors! Besides reduction in failure costs also reductions are possible in systems for stock management and order processing. Data only have to be entered once and can be used for multiple purposes. Efficient management of product databases! ..so the exchange of information is always based on the same, original data in all directions – from and to supplier. Product information from the source and thus up to date, correct and complete! 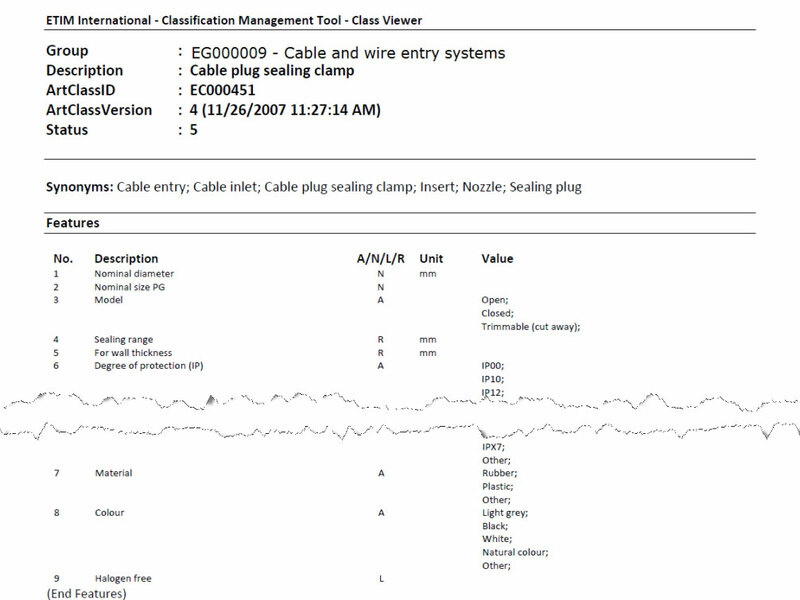 Data are media neutral and can be used for different lay-outs (catalogue software). This leads to time savings, less corrections and lower production costs! In the future only a few standard interfaces are needed for the exchange of product data. Continuous adaptation of systems to new demands are no longer needed! It becomes possible to arrange information to target group, 1 on 1 marketing possible. Unique product features are emphasized by complementary, specific marketing texts. Distinguish by extra service! Classification makes statistical analysis possible. Turnover figures and strategy possible on product class level! 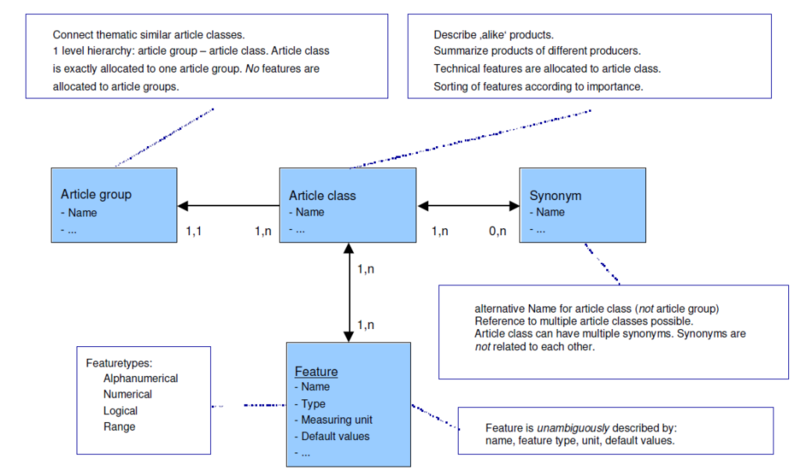 All classes, features, values and units have a clear and unique identifier that is language-independent; the description of the entities however is language-dependent. The ETIM model is a two-level classification model. The two-levels consist of the product group and product classes. The product group is used to order the product classes. Every product class is assigned to exactly one product group. Nevertheless, ETIM is organized flat, because the groups are only for the convenient organization of the management of the product classes. Essential – and that is the real focus of ETIM- is the definition of product classes and their features. Describes similar products, bundles products of different manufacturers or suppliers; all product classes have features to specify the technical characteristics of the products in the class, the features of each class are ordered due to their importance and are also structured meaningful (dimensions, features of electrical data, …). A feature is clearly described by: description, feature type, unit and/or value. To each alphanumeric feature of an ETIM class, a fixed list of possible values is assigned; the order of this value list of a feature within an ETIM class is sorted language-dependent; so the value list of the feature “EF000007 – Colour” can be different in each ETIM class that uses this feature. Numerical and range features always need a unit of measurement which defines what value is expected. An exception are features like “number of…”. These numerical features do not need a unit. Also often referred to as “keyword”, it means an alternative name for a product class (not for a product group) and a reference to several product classes is possible, a product class can have several synonyms, synonyms are not related to each other. A synonym does not have an ID, it is directly assigned to an ETIM class (language-dependent). The local ETIM organization is responsible for the synonyms in the local language. Since there is not yet a (native English speaking) local ETIM organization in Great Britain, the TC has the final responsibility regarding the English language version, including the synonyms. The ETIM data model is completely uniform, differing only in the language. The exchange format for classified product data, not to be confused with the release format for the data model, however is set and defined by each local ETIM organization individually. ETIM International recommends the BMEcat® standard, which is the most common exchange format within the ETIM countries. The BMEcat®-Standard was introduced in November 1999 in cooperation with the BME e.V. 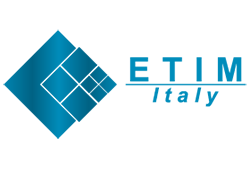 (German Federal Association for Materials-Management, Procurement and Logistics) as a standard for electronic data-transfer of multimedia product-catalogues. It is based on the internet-standard XML (Extensible Markup Language) as a universal platform and manufacturer-independent exchange-format. Catalogues created in this generally-accepted format prevent special individual solutions for different customers. The BMEcat®-standard today counts as one of the most strongly accepted formats for e-business. Numerous well-known companies e.g. American Express, AUDI, Bayer, BMW, Deutsche Bahn, Philips, Siemens, VISA and many others take part in the BMEcat® initiative. However, in some countries specific national formats are still in use and accepted as sector standard, sometimes in addition to BMEcat®. To get the information which data format is currently established in an ETIM country, please contact your local ETIM office.